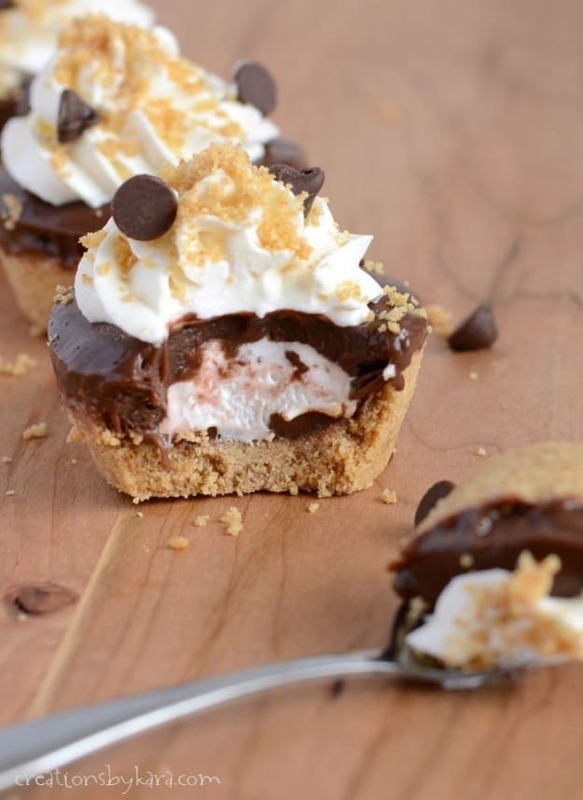 I like these Frozen S’mores Cups even more than actual s’mores! A graham cracker crust, chocolate ganache, marshmallow creme, chocolate pudding, and whipped cream all layered into one cute, frosty treat. What’s not to love? 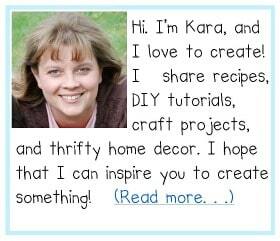 Today is the day I join in with my other Celebrating Food bloggers to celebrate National S’mores Day. I actually had another recipe all typed up and photographed. But somehow in the whole computer transfer after my old computer bit the dust, I lost the photos. So I ended up making this recipe instead. Which ended up not really being a bad thing. 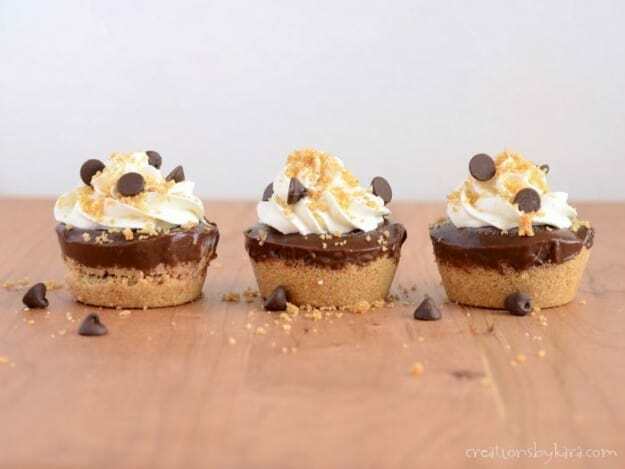 Because these cute little s’mores cups are incredible! Plus it turns out my photos weren’t actually lost for good, my husband was able to recover them. Bless him, this website would be an epic fail without his tech skills. 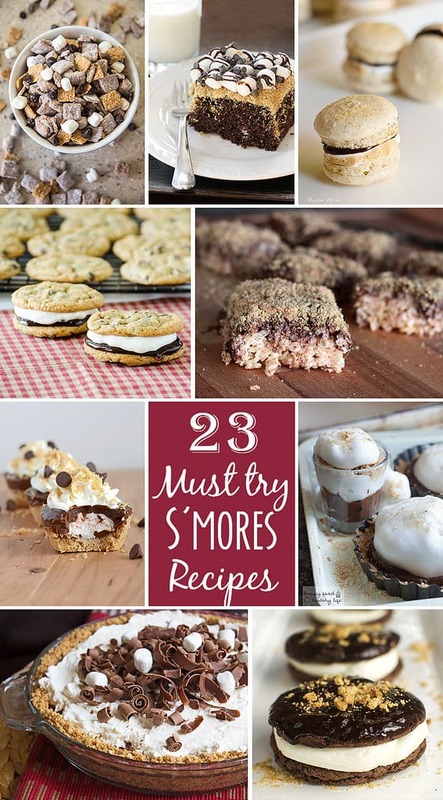 And now you have another yummy s’more recipe to look forward to in the coming days. I enjoy a good campfire s’more now and again, but these frozen s’more cups are actually more up my alley. Especially during the summer. Because hello- frozen. Nothing’s better than a cold treat when it’s so hot outside you feel like your skin is going to melt off. 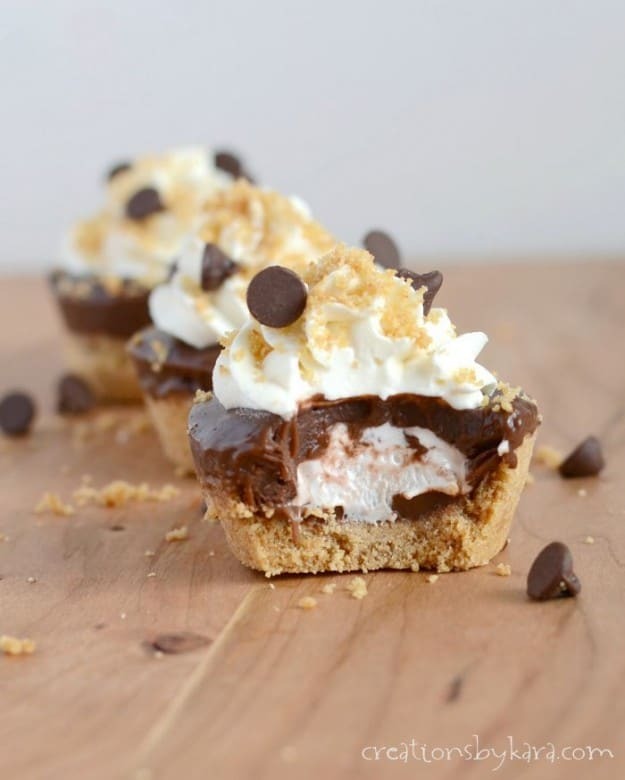 These little s’more treats are so cute and fun to serve. Who doesn’t like their own personal dessert, especially when it has five layers of yumminess? Another thing I liked about serving them? From the outside you can’t see that layer of marshmallow creme in the middle. So you get a creamy surprise when you take your first bite. FUN! For crust, finely crush the graham crackers to make about 1 1/2 cups crumbs. Add the melted butter mix well. [b]Set aside about 3 tablespoons for garnish[/b]. Press remaining crumbs into the bottoms and up the sides of 12 muffin cups. Place in the freezer. Melt the 1/2 cup chocolate and the 1/4 cup cream in a glass bowl in the microwave, stirring every 30 seconds till smooth. Cool slightly, then divide between the 12 crusts. Freeze for 15-20 minutes or till set. Spread about 1 tablespoon of marshmallow cream on top of each chocolate layer. Remove from freezer about 10 minutes before serving. Use the edge of a plastic knife to loosen the cups, then they should just pop out. If you need to, you can tip the pan sideways and run hot water over the bottom to loosen them. Just before serving, whip the cream till soft peaks form. Add the vanilla and powdered sugar and continue beating till stiff peaks form. Pipe onto the frozen cups. Garnish with the reserved crumbs and chocolate chips. Recipe inspired by Easy Baked. Looks delicious. I might try a pan version to simplify filling the layers.